The right tires not only contribute to your vehicle’s handling and performance, but can also impact fuel-efficiency and safety. If your tires are showing signs of wear, you can get exact replacements for the original tires at a Toyota dealership. Salt Lake City drivers can rely on Brent Brown Toyota’s service center for quick and experienced tire care. Our factory-trained and certified Toyota technicians will ensure that your tires are mounted, balanced, and inflated to match your Toyota vehicle’s specifications. 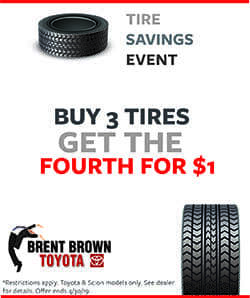 Purchase Authorized Tires at Brent Brown Toyota Near Provo! When it comes to genuine Toyota tires and tire repair, you have a lot of car dealerships in Utah County to choose from. However, when you visit Brent Brown Toyota, you’ll enjoy access to services like ToyotaCare, free WiFi, shuttle service, and more! 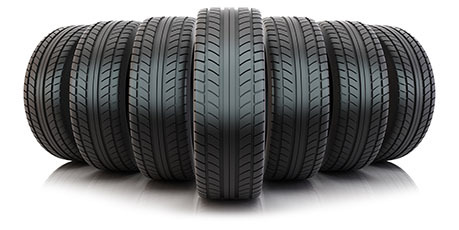 Contact us with any questions about our tire services and parts specials. Hop into spring with this tire offer. Take advantage of it for the entire month of April. Restrictions apply. See participating Toyota dealer for details. Offer valid on select brands. OEM, OEA and WIN replacement tires only. Tires must be dealer installed. Three tires at regular price, fourth tire for one dollar. Fourth tire must be of equal or lesser value. Excludes mounting and balancing, sales tax, shop supplies, tire disposal, and other applicable taxes. Excludes previous purchases. Toyota and Scion vehicles only. Offer only available at participating Toyota dealers.